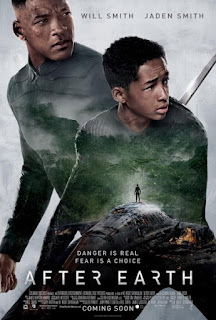 It’s been interesting watching the reaction to After Earth, a teaming of actor and director that a few years back would have been a major event: superstar and 4th of July cinematic savior Will Smith and the man who at one time seemed the heir to Rod Serling’s legacy of plot twists, M. Night Shyamalan. Once they were among the most popular and highest-earning talents in their fields. Now Shyamalan is regularly subjected to Ed Wood/Uwe Boll levels of scorn while most of the discussion about Smith focuses on whether he’s a Scientologist or not. Both have also earned reputations for egotism that have come to overshadow the work they put on the screen. Since Smith produced this film and developed the story, which reteams him with his son Jaden Smith, it is clear he hoped it would be a big career breakthrough for the younger Smith, who bears the heavy burden of being next in the line of succession for his father's box office crown. It’s also notably the first time Shyamalan has directed a film he didn’t write on his own and it doesn’t include the type of customary third act twist that he once built his career on and has since become reviled for. I will admit to being something of a Shyamalan apologist, to a point. I think the three films he initially created his brand with, The Sixth Sense, Unbreakable, and Signs, are all excellent and while its twists aren’t hugely innovative, I think the Village is great as well. Lady in the Water has some major problems but also has some really interesting thematic ideas about the role of stories and mythology in society. I freely admit that The Happening and the Last Airbender are both horrible movies and it’s at times hard to detect any of the technique or skill the previous films contained. That said, I still don’t quite understand the often smug glee with which he is vilified throughout the comment sections of websites, an act which seems to have become something of an internet pastime. I’ve preferred to hope that he will find his footing again and return to the level of quality that characterized his earlier work. Unfortunately, the popular and industry narratives that have developed about this film in the media seem to derive a lot less from what’s presented onscreen and more on the personalities and reputations of the two men behind it. Some have claimed it’s the worst film since Battlefield Earth and it has been similarly accused of promoting some shadowy Scientological agenda, which I contend is a really silly allegation straight out of 237. Others are saying this is the final nail in Shyamalan’s career coffin, which based on the poor box office, is a much more legitimate and unfortunate possibility. That said, I come not to bury After Earth but to praise it, guardedly at least. I can’t claim it will shine in the annals of cinema as a science fiction classic, nor can I dismiss it outright as the disaster that many claim it is, and I suspect, would like it to be. It is merely a derivative but sufficiently entertaining survival tale in a futuristic setting. That setting finds humanity having left the Earth, which has been despoiled through pollution and neglect. 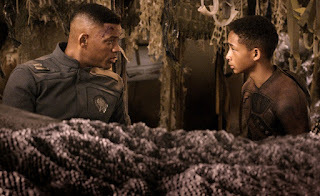 However, the colonization of other worlds has brought mankind into conflict with another alien species, with the resulting war fought by rangers such as General Cypher (yes, it's a silly name... get over it) Raige (Will Smith), whose total lack of fear has made him humanity’s most effective soldier. 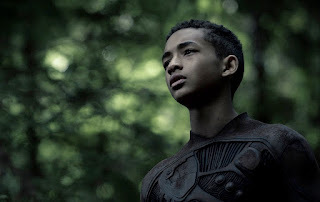 It’s a reputation that intimidates his young Kitai (Jaden Smith), who is struggling to become a ranger himself to earn the respect of his distant father. With Cypher planning to quit the service to spend more time with his family, he suggests Kitai accompany him on his last training mission. Their chance at reconciliation is put on hold after a gravity storm sends their ship crashing onto the abandoned Earth, now a jungle world of hostile wildlife, toxic atmospheric gases and dangerous shifts in temperature. The injured Cypher resumes his command role and assigns Kitai to traverse miles of dangerous terrain to another section of wreckage and retrieve a homing beacon that can summon a rescue. Despite the involved backstory, we have here a relatively simple tale that could easily have been told in a realistic modern setting and which features many familiar elements; discord and strain in a military family, the inner conflict of a son who wants his father’s love and respect even as he bitterly blames him for traumas of the past, and a character lost in the wild who is forced to rise above his self-perceived limitations and tap into his primal instinct to survive. As mentioned, Shyamalan eschews tossing some drastic twist into this rather commonplace story, leaving us with no real surprises. Kitai’s journey is presented with a straight-forward visual style and the well-worn but effective emotional beats of the story are expected to carry us through. This standard plot is however given a fresh coat of paint via the considerable efforts expended on world-building, much of which is wisely allowed to remain in the background. Characters have subtle traces of varying futuristic accents. Clothing styles almost seem to be an updated form of the futurism we saw in 1970s sci-fi such as Logan’s Run. The medical, weapon and flight technology feels well-thought out. Architecture and even the honeycomb building materials used for spaceships are unique and strange. All this is merely set dressing, but at least it's attractive set dressing. After our introduction to this imagined progression of humanity, we’re dropped into the second post-apocalyptic Earth presented to us so far this year following Oblivion. The contrast between the depictions of our world in each film is striking. While Oblivion showed us future Earth as an abandoned wasteland, here we get a planet that has been reclaimed by nature. There are few remnants of human society visible other than occasional glimpses of manmade architecture. Instead we see a strange new environment filled with tons of opportunities to die in notably nasty ways. Familiar animals, realized through inconsistent special effects, have continued along evolutionary lines to become even more efficient predators. The hostile atmosphere requires the use of oxygen devices to breathe. A tiny bite from a slug can lead to a gruesome allergic reaction. Small visual touches, such as the protective reactions of plant life as one of the dangerous periods of frost approaches, give us the impression of a real, functioning ecosystem. Important to the film’s themes and war backstory are the Ursas, creatures bred by the unseen alien adversaries to hunt humans by detecting pheromones released when experiencing fear. While this doesn’t seem the most practical trait to instill into a creature intended to kill, it does serve the film’s thematic ideas. With one of them liberated from the ship’s hold during the crash and now tracking Kitai, he faces a terror endemic to children: that inescapable moment when there will be no parent around to protect them anymore. 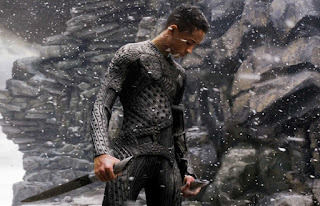 This fear has become crystallized in Kitai due to the death of his sister Senshi (Zoe Kravitz) at the claws of an Ursa, an incident that occurred while their father was away. On the other side of the relationship, there’s a subtext suggesting that Cypher’s fearlessness, which has allowed him to move undetected by the creatures and thereby gives him the advantage when fighting them, has come at the high cost of him having to disconnect from his family. A large aspect of having a family is fear for their well-being, for their future, and the possibility of failing them. These are fears that Cypher must finally face himself with Kitai trudging through the wilderness, making his own choices. A lot of the film’s scorn has been focused on Jaden Smith and while he doesn’t have the easy charisma of his father, I’m willing to cut him a bit of slack considering some of the demands made on him. Much of the film’s running time requires him to hold the screen by himself, a difficult task for an experienced actor much less one who’s practically just starting out. His delivery often sounds stilted and odd until it becomes clear he’s attempting one of those accents mentioned earlier, a requirement that holds back his performance. Though much of his physical presence consists of a hang-dog expression intended to express his fear and despair, he fares better when he finally gets opportunities to communicate Kitai’s inner turmoil, such as a frustrated, angry tirade against his father or his dream interactions with his deceased sister. Smith the Elder has again taken a role that prevents him from relying on his goofy charm and usual wisecracking persona and is compelling as Cypher, suggesting the regrets and concerns that are developing behind the steely surface. He exudes a chilly decisiveness that make us believe that others would follow his commands but is also convincing when expressing the palpable discomfort he feels around Kitai as he attempts to relate to him as a father rather than a superior officer. He also has a bit more luck than Jaden with his character’s particular accent. The only other cast members of real note are Sophie Okonedo as Cypher’s wife and Kravitz, both of whom are fine in their limited screen time. 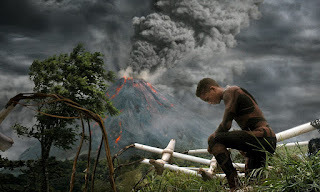 Big summer movies aren’t generally expected to be tremendously innovative, but they do usually offer a greater level of spectacle than After Earth contains. As such, this one’s less likely to be a favorite with audiences or the home run Smith wanted for his son or the creative masterpiece that Shyamalan needed to resurrect his career. However, it also isn’t the most offensively terrible movie that ever was. 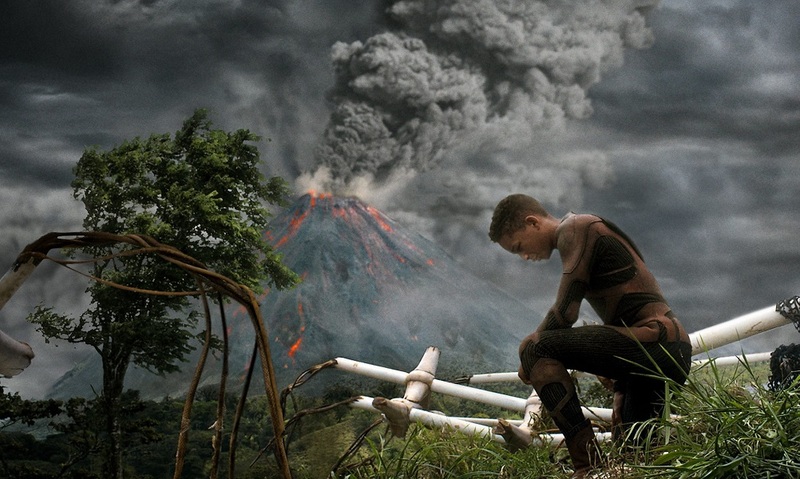 Taken on its own terms and held to less ambitious goals than its creators probably had for it, After Earth emerges as a diverting and occasionally even moving boy’s adventure tale. Fear not, internet: there are bound to be plenty of bad movies this year.